I see you and I see you’re afraid, in pain, in fear and wondering just the hell is going on. It’s been a long week? Month? Couple of months? Years? There is a lot of angst, anger, hurt and worry happening right now. Fear is rearing its ugly head and it’s in a feeding frenzy right now. Let’s all take a collective breath shall we? I have spoken with many friends, a few clients and have found myself feeling really anxious too about the state our world is in right now, and the direction its seems to be heading. The first thing I did was take a break from the intensity out there in the news and social media. Don’t get me wrong, I’m not advocating ignorance and sticking my head in the sand to pretend there is not a whole lotta stuff going sideways right now. Still, we can exist in a state of fear and anxiety 24 hours a day for long without ending up sick, burned out and a big ol’ mess. We can’t allow that to happen. We can’t because there is a lot of work to and the world needs you. It would be really easy to despair right now when it is looking like things are falling apart all around us. I could feel it creeping up on me too. So I stopped and went within. I meditated, journaled and asked for guidance. And this? THIS is a wake up call. It’s time – your time, my time…OUR time – to step out of the shadows and start shining the light we have within in a much bigger way. It’s time to stop just ‘doing our things’ quietly with our like-minded (safe) friends and time to start talking about them in a very real way. It’s time to speak up through love’s lens. Amazing things happen when we do – we KNOW this. And so I believe these things are falling apart so we can see what needs to be healed. So we can have more opportunity to choose love, even when it feels risky and scary. So we can speak the truth, even when our voice is trembling. And so we can find the others and link arms, join hands and lift each other up. Actions done in love, with love trump hate Every Single Time. It’s time we stop watching and start the do-ing. And we need to start do-ing MORE. 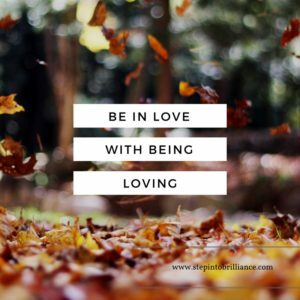 Be in love with being loving. Make it an ethical concept to sharing your loving energy where ever you go and with whomever you meet. The kind of deep commitment to it that you might have with taking care of your child…where you’d do anything for them? You see – that’s the kind of commitment we must have to living from a loving place. You, (yes you – all ONE of you) has a great deal of power to change the world around you. I think this is the message the mess we are in right now is bringing. It isn’t always easy or convenient that’s for sure and sometimes is damn scary. But I believe it’s necessary for more (all?) of us to make that choice in order to get the world back on a path that leads to peace. A number of years back someone told me a quote that went something like when there is a lot of pain or hurt or scary times we need to look for the helpers…there are always helpers. I think now we need to shift that slightly and add to it – and if you can become a helper, we must do so. It is our duty as parents, husbands, wives, teachers, light-workers, joy-bringers, spiritual beings and citizens of this beautiful world to do this.